Exeter secured a home Premiership semi-final with a victory on the final day at Gloucester, who finish ninth. Having trailed 15-13 at half-time, Chiefs were more clinical in the second period to earn an impressive away win. Lewis Ludlow and Jonny May's first-half tries had put Gloucester ahead, before Ian Whitten went over for Chiefs. Ben Moon, James Short and Will Chudley then all crossed after the break as Chiefs took a decisive lead, while May added a consolation for the hosts. 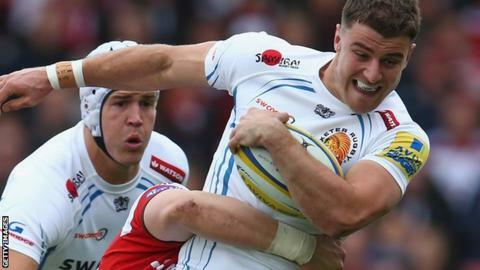 Exeter will now host third-placed Saracens in their semi-final, while Gloucester - who made eight changes before Friday's Challenge Cup final in Edinburgh - will need to beat Stade Francais in order to compete in the Champions Cup play-offs instead of seventh-placed Northampton. After a sustained spell of early Gloucester pressure, May fed Ludlow for the opening score and, after Greig Laidlaw exchanged penalties with Gareth Steenson, May intercepted a loose Steenson pass to run clear. Whitten then cut through Gloucester to cross for Chief's first try, before his vital last-ditch tackle prevented Charlie Sharples from extending the hosts' lead. After half-time, Moon and Short both went over in the corner in quick succession, before May crossed for his second for the Cherry and Whites and Laidlaw brought them to within seven. But Chudley's try made the win safe for Chiefs, who finished second, level on points with table-topping Wasps, who beat Sarries. "To have Saracens there (at Sandy Park) will be fantastic. Everyone knows how good Saracens are and we could be potentially playing the best side in Europe in a home semi-final. "I'm really pleased we have two weeks to prepare for it. We need it as we have boys bumped and bruised. We will have players back which is fantastic as well and it will make training next Wednesday, Thursday and Friday a bit spicy because the guys will want to lay down some markers to get into that semi-final team." "We mixed some tremendous rugby but the difference between the two sides was they were accurate when they had their opportunities and took them. "We were not accurate so that is why they are a top-four side because they don't need a huge number of invitations to take points. We did well to take our scores but, ultimately, it was poor execution by us." Gloucester: Hook; Sharples, Scott, Atkinson, May; Twelvetrees, Laidlaw (capt); McAllister, Hibbard, Afoa, Savage, Galarza, Clarke, Ludlow, Morgan. Replacements: Dawidiuk, Thomas, Hohneck, Thrush, Rowan, Heinz, Thorley, Trinder. Exeter: Nowell; Woodburn, Whitten, Devoto, Short; Steenson (capt), Townsend; Moon, Cowan-Dickie, Williams, Atkins, Parling, Dennis, Salvi, Horstmann. Replacements: Yeandle, Rimmer, Francis, Skinner, S Simmonds, Chudley, J Simmonds. The best Premiership final round ever?